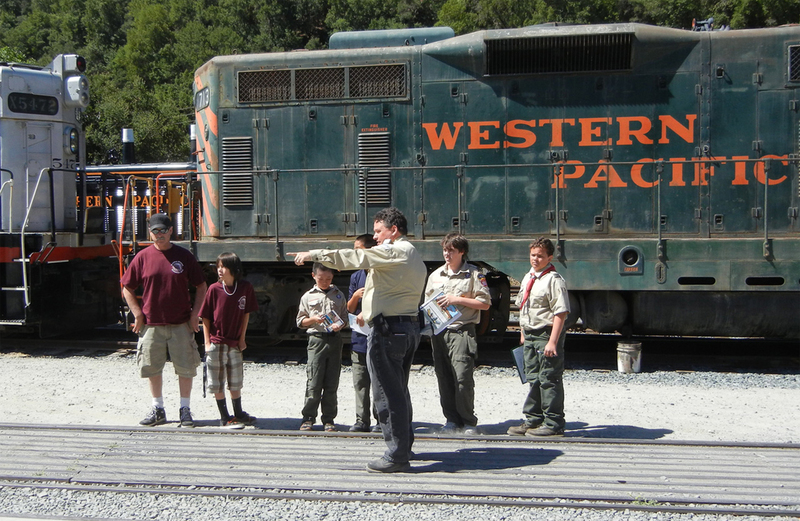 Boy Scouts of America has recognized a Railroading Merit Badge since 1952, and Niles Canyon Railway has hosted a Scouting program since 2007. We sponsored many half-day merit badge study sessions and occasional full-day programs to help Scouts complete their Railroading Merit Badge or Council Badge. Did you know that California led all 50 states in 2007 – 2016 for the most fatalities, and the most serious injuries, from trespassing along the railroad right-of-way? California has had more than twice as many fatalities than the number two on the list (usually Texas), year over year! Operation Lifesaver is trying to change that through Education, Enforcement, and Engineering (Part of their mission is the reason that both the BSA and GSA badge programs have a requirement to learn about this important organization). This year will be full of many special events, aligned around the 150th anniversary of the Golden Spike in Utah, and the completion of the final leg of the Transcontinental through Niles Canyon back in 1869. As these event plans are announced, we MIGHT announce a few more dates this year. To make sure you know about them as soon as possible, please follow us on Facebook or Twitter. Scouts are strongly encouraged to review the current Railroading Merit Badge Requirements on the Internet (and explore the helpful links at the bottom of that web page). Scouts should also consider buying or borrowing a new (color) revision of the 2009 Railroading Merit Badge Handbook. This new rewrite hasn’t changed the requirements, but it has added a LOT of good, useful information, making it a better resource for learning what a Scout will need to know for this merit badge. MeritBadge.org also has a Railroading Merit Badge Worksheet available. While it is not a requirement to use this form, using the worksheet is a great way for a scout to organize their notes to be prepared for their sign-off. RSVP to attend one (or more) of the sessions above, to reserve a seat. We will begin planning for our 2020 year in December of 2019, and we’ll announce our decisions in January 2020. Please subscribe to our Facebook or Twitter account(s) to be sure you find out about it as soon as we announce it.